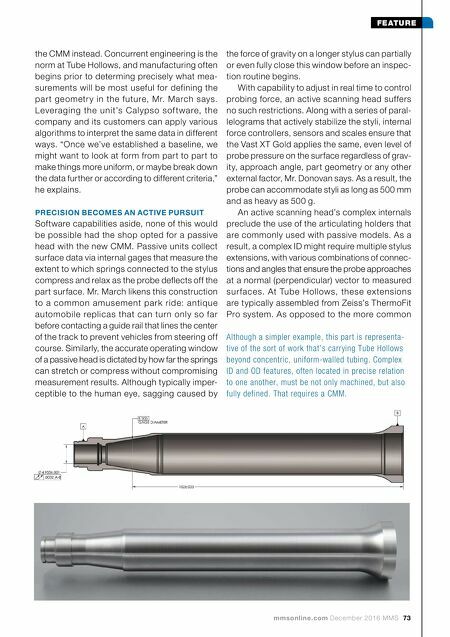 mmsonline.com December 2016 MMS 73 FEATURE the CMM instead. 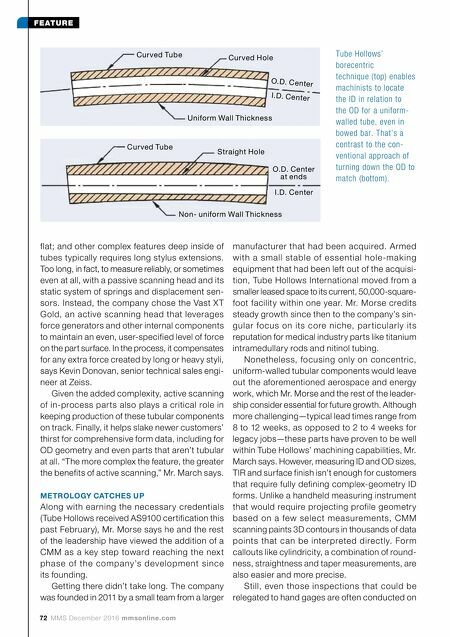 Concurrent engineering is the norm at Tube Hollows, and manufacturing often begins prior to determing precisely what mea- surements will be most useful for defining the par t geometr y in the future, Mr. March says. Leveraging the unit's Calypso sof t ware, the company and its customers can apply various algorithms to interpret the same data in different ways. "Once we've established a baseline, we might want to look at form from part to part to make things more uniform, or maybe break down the data further or according to different criteria," he explains. PRECISION BECOMES AN ACTIVE PURSUIT Software capabilities aside, none of this would be possible had the shop opted for a passive head with the new CMM. Passive units collect surface data via internal gages that measure the extent to which springs connected to the stylus compress and relax as the probe deflects off the part surface. Mr. March likens this construction to a common amusement park ride: antique automobile replicas that can turn only so far before contacting a guide rail that lines the center of the track to prevent vehicles from steering off course. Similarly, the accurate operating window of a passive head is dictated by how far the springs can stretch or compress without compromising measurement results. Although typically imper- ceptible to the human eye, sagging caused by the force of gravity on a longer stylus can partially or even fully close this window before an inspec- tion routine begins. With capability to adjust in real time to control probing force, an active scanning head suffers no such restrictions. Along with a series of paral- lelograms that actively stabilize the styli, internal force controllers, sensors and scales ensure that the Vast XT Gold applies the same, even level of probe pressure on the surface regardless of grav- ity, approach angle, part geometry or any other external factor, Mr. Donovan says. As a result, the probe can accommodate styli as long as 500 mm and as heavy as 500 g. An active scanning head's complex internals preclude the use of the articulating holders that are commonly used with passive models. As a result, a complex ID might require multiple stylus extensions, with various combinations of connec- tions and angles that ensure the probe approaches at a normal (perpendicular) vector to measured sur faces. At Tube Hollows, these ex tensions are typically assembled from Zeiss's ThermoFit Pro system. As opposed to the more common Although a simpler example, this part is representa- tive of the sort of work that's carrying Tube Hollows beyond concentric, uniform-walled tubing. Complex ID and OD features, often located in precise relation to one another, must be not only machined, but also fully defined. That requires a CMM.